Visitors to Chiang Mai usually head up the mountain to visit Wat Doi Sutep. Beautiful and impressive though this temple is, it can get quite crowded on weekends and holidays. 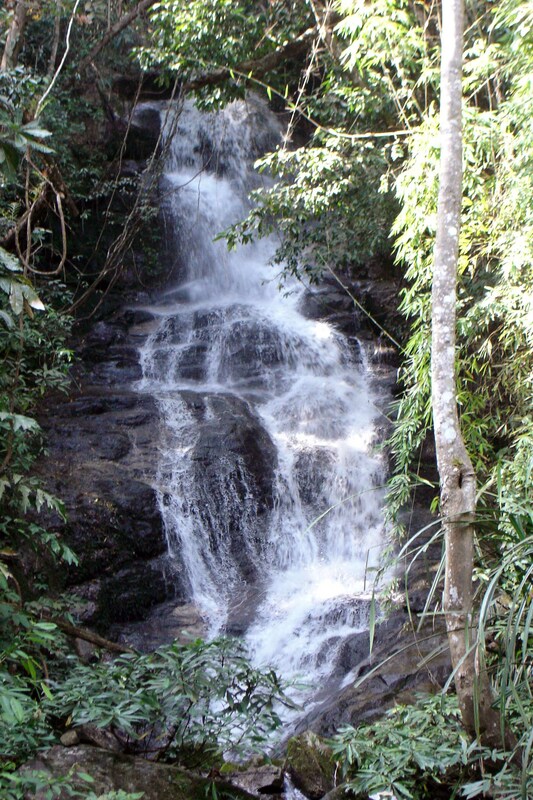 But just beyond the temple, and hardly visited at all, is a lovely peaceful national park (Doi Sutep-Pui NP) where it is possible to walk through the forest, look up at towering canopies and visit tranquil waterfalls. It is also a good place to look for birds and butterflies. 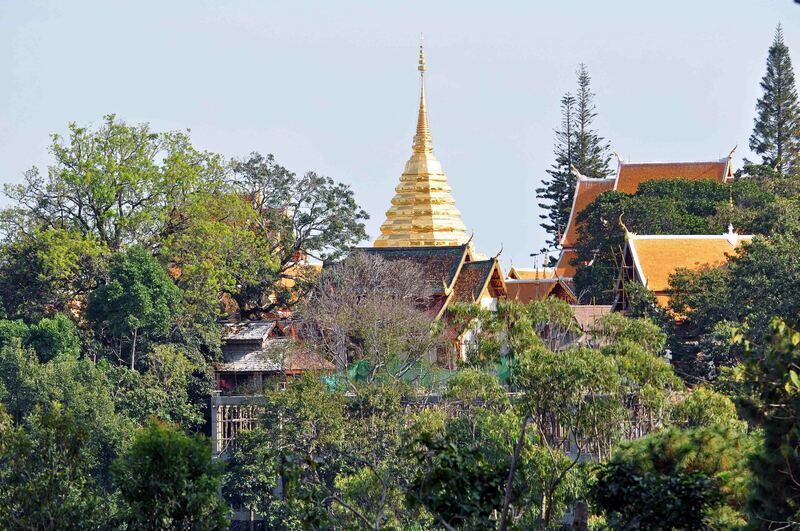 The park headquarters are located just beyond the hustle and bustle of Wat Doi Sutep (there is even a path leading up from the temple to the HQ). 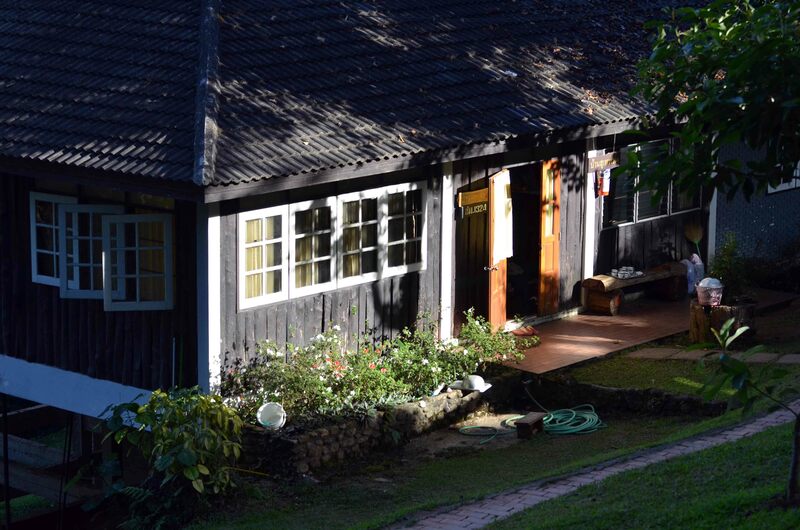 I have never stayed in the park, but there are a variety of differently sized bungalows and a camp site; school and university parties sometimes stay here. From the HQ it is possible to walk along an old track through the forest which eventually leads, after quite a few miles, to a Mong village. There is also a footpath leading off the track which goes down to the small Sai Yoi waterfall, but it is steep, so care is needed. I have walked this track for many years. A few years back however, I was quite surprised to see signs appear, which stated that it was not permitted to walk the paths without obtaining prior permission. Since one had to go all the way back to Chiang Mai city to get permission, this presented one with something of a dilemma! I was however, most relieved on my last trip (in December 2014) to see that the signs had been taken down and the policy seems to have reverted to that of advising visitors to take care. There must have been some incident which led to the strict policy and it is certainly a good idea to go with a friend, or let someone know where you are going. Having said that, I enjoy the experience of walking in the forest by myself! It is not exactly an unspoiled wilderness; mountain bikers also use this track, so it you take care it is quite safe. 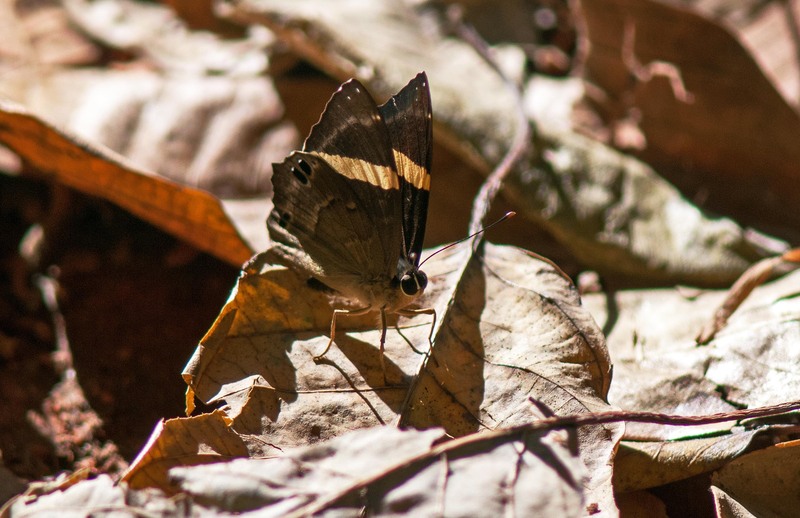 It is a good place to see butterflies and other insects, especially around the streams which run across the track in some places. Birds also tend to congregate near water. I saw my first silver-breasted broadbill (Serilophus lunatus) on this walk. 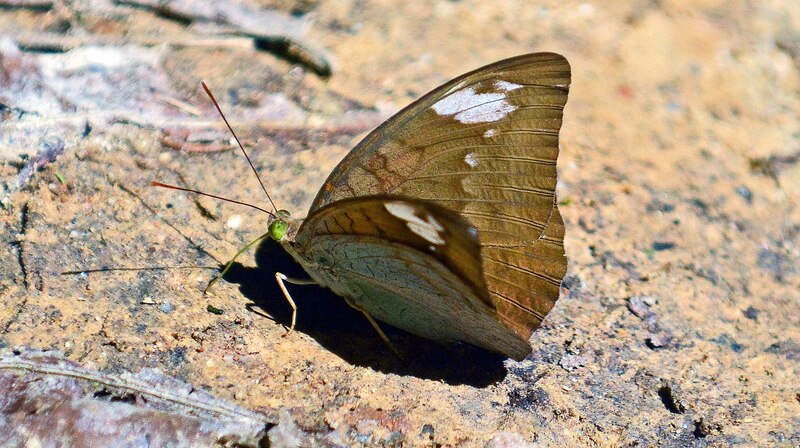 Some butterfly species are very common, including the Common Earl (Tanaecia julii odilinia) – see separate blog: The Common Earl, a butterfly with green eyes! 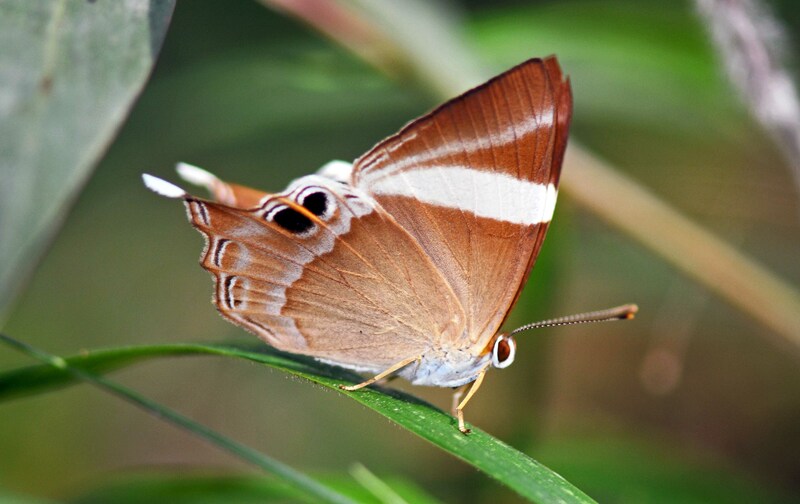 – and The Tailed Judy (Abisara neophron chelina), both of which tend to alight on foliage along the track. Another species, which is very common, is the Dark Judy (Abisara fylla), which typically alights on the dried, fallen leaves on the ground where it is perfectly camouflaged. 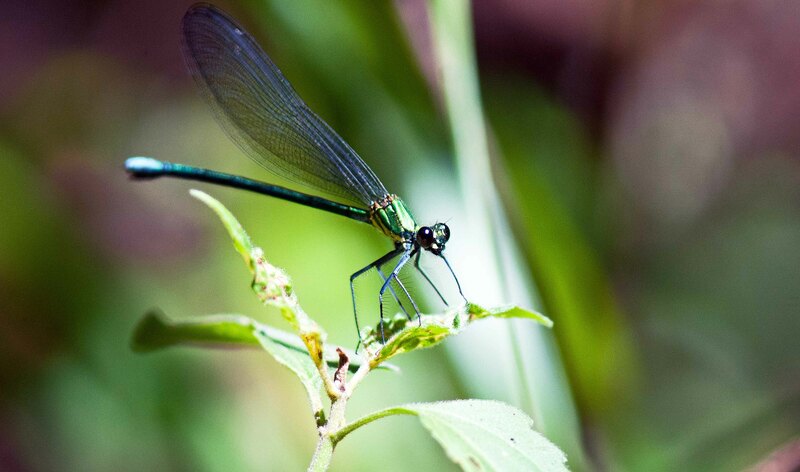 Another type of insect which I enjoy seeing on this walk are damselflies. 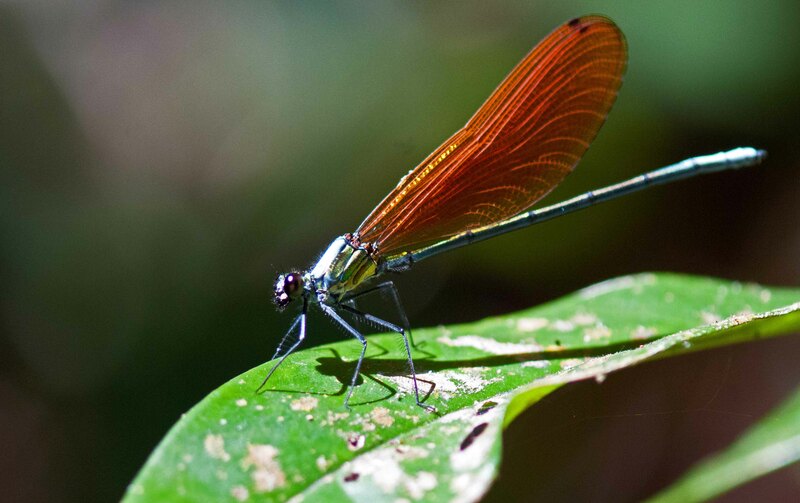 These delicate little jewels are particularly common near the streams and waterfalls, where they hunt for insects. They perch on foliage, with their huge eyes looking out for suitable prey items to sieze! To try to capture my experiences of walking this track, I painted a picture where I incorporated a few butterflies, based on photographs I had taken. 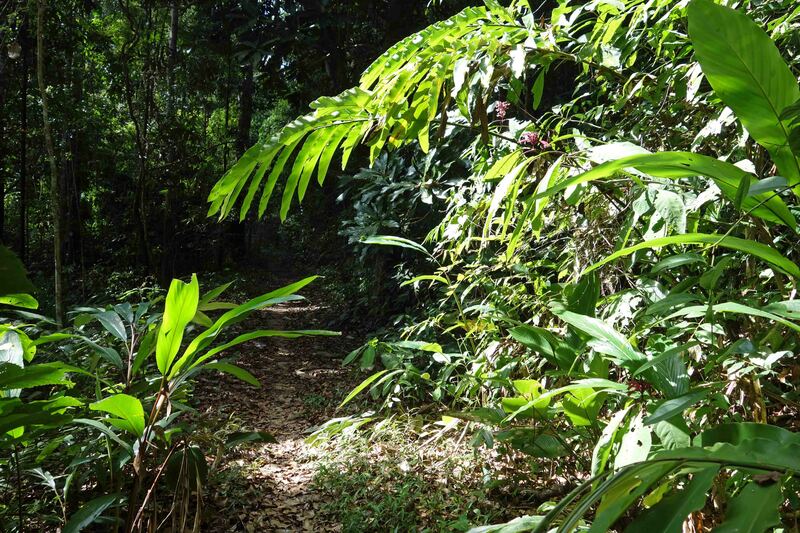 I an not sure whether it does it justice, but at least it reminds me of the many enjoyable walks I have had through this piece of forest in northern Thailand. 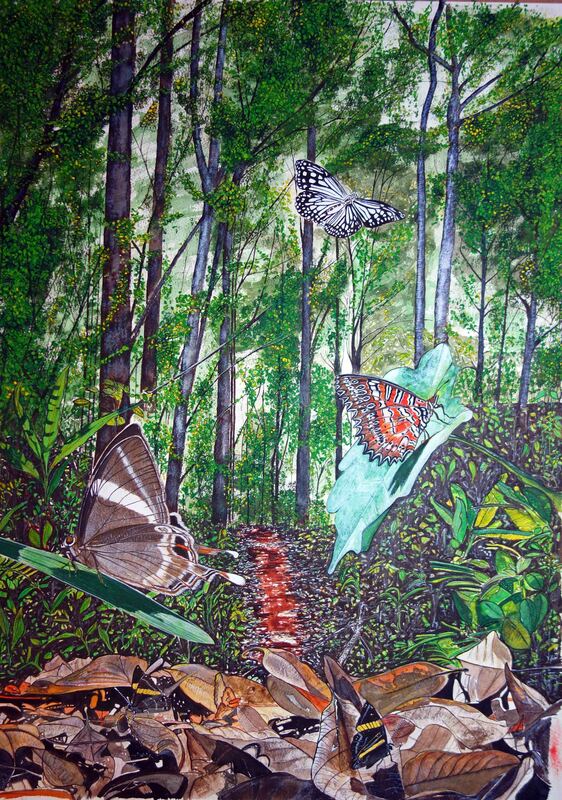 As well as the species already mentioned, the other butterflies I included in this painting are the Red Lacewing (Cethosia bilbis bilbis) – see separate blog: Cethosia biblis Drury, 1770 – and the Glassy Tiger (Parantica aglea) which is flying upwards at the top of the painting. Previous Previous post: A hard nut! Fascinating post and a beautiful painting.